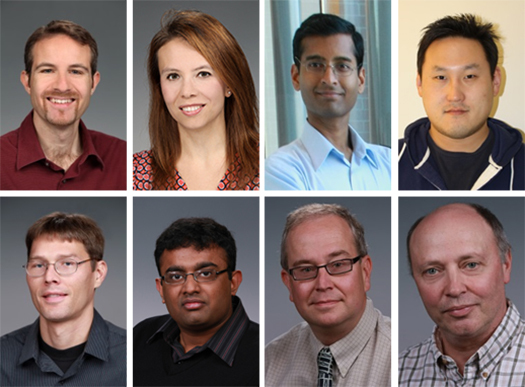 With four total papers accepted for this year’s conference, including two nominees for Best Student Paper award, members of PNNL’s Advanced Computing, Mathematics, and Data Division High Performance Computing group continue to expand their collaborations and build on previous successes at the International Conference for High Performance Computing, Networking, Storage and Analysis, now SC15. Held annually, SC15 is the leading venue for publications in the field of high-performance computing, making it among the most competitive for researchers. Clockwise from top left: Roberto Gioiosa, Gokcen Kestor, Sriram Krishnamoorthy, Shuaiwen Leon Song, Adolfy Hoisie, Darren Kerbyson, Abhinav Vishnu and Nathan Tallent. Enlarge Image. For “A Case for Application-oblivious Energy-efficient MPI Runtime,” former PNNL intern Akshay Venkatesh, the paper’s primary author, along with his colleagues and advisor from The Ohio State University, partnered with PNNL’s Abhinav Vishnu, Nathan Tallent, Darren Kerbyson, and Adolfy Hoisie. The paper, which proposes an energy-efficient Message Passing Interface runtime that requires no application-specific knowledge or expectations of temporal application properties, is a SC15 Best Student Paper award finalist. Shuaiwen Leon Song, a research scientist with ACMD Division’s HPC group, served as a mentor to students from the Georgia Institute of Technology, to deliver the second SC15 Best Student Paper award finalist: “GraphReduce: Processing Large-scale Graphs on Accelerator-based Systems.” The paper presents a highly efficient and scalable graphics processing unit-based framework that operates on graphs exceeding a device’s internal memory capacity. It describes graph input and algorithm evaluations that demonstrate how GraphReduce outperforms other out-of-memory approaches. ACMD Division HPC scientists Gokcen Kestor and Roberto Gioiosa, along with researchers from the University of Central Florida’s Computer Architecture Laboratory and IBM’s Thomas J. Watson Research Center, co-authored “Understanding the Propagation of Transient Errors in HPC Applications,” which closely examines resiliency in exascale systems. Their work toward configuring the most power-efficient fault tolerance mechanisms employs a fault propagation framework to analyze how faults proliferate in parallel MPI applications, as well as a machine learning technique to develop effective application fault propagation models. Notably, Sriram Krishnamoorthy, another research scientist with ACMD Division’s HPC group, added to his ongoing Supercomputing streak. The paper, “Speculative Relaxation of Concurrency Constraints in Cilk Programs,” co-authored with collaborators from the University of Michigan, marks his 11th paper accepted by SC conferences overall. This time, Krishnamoorthy and his colleagues are simplifying parallel programming using approaches to alleviate concurrency constraints imposed by recursive parallel programs, such as Cilk. The SC15 theme is “HPC transforms,” and this year’s conference will focus on how HPC transforms both the everyday and the incredible. SC15, which spotlights HPC-related scientific applications and innovations from all over the world, is being held on November 15-20, 2015 in Austin. All papers to be presented at: International Conference for High Performance Computing, Networking, Storage and Analysis (SC15). November 15-20, 2015, Austin, Texas.